Serve your iced drinks in these large, reusable, 20 oz frosted flex plastic Graduation party souvenir cups. 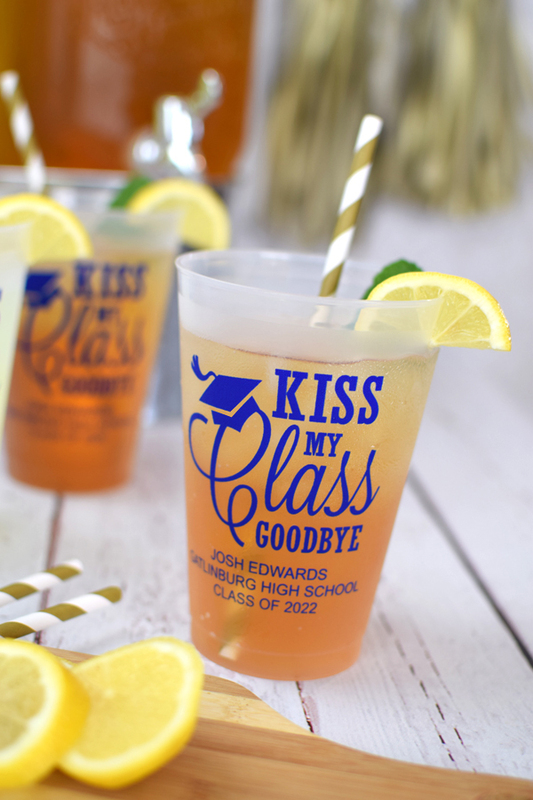 Custom printed with a festive graduation design and your own special message, these cups make great favors for your milestone grad party. Your guests can take their cups home as souvenirs after your party is over. Since they are dishwasher-safe in the top rack, these cups are durable and will last long after your party. Made from BPA free, frosted, flex-plastic, these cups are dishwasher safe in the top rack and will comfortably hold around 16-18 fluid ounces (20 ounces when full to the brim). Personalize your cups with a graduation design and your own custom message printed in your choice of imprint color and lettering style. These cups are the ideal size for holding iced drinks. Two-sided printing available at no additional cost. Want two different lettering styles? Simply let us know in the special instructions box provided. great quality, fast shipping, was very pleased with the product and would highly recommend. These cups are amazing, they look way better than I could have ever imagined. The cups were better than we thought. It will bring a special touch to my daughterÃ¢â‚¬â„¢s celebration graduating from high school. The purple ink we chose matched perfectly to her school colors. Wow! 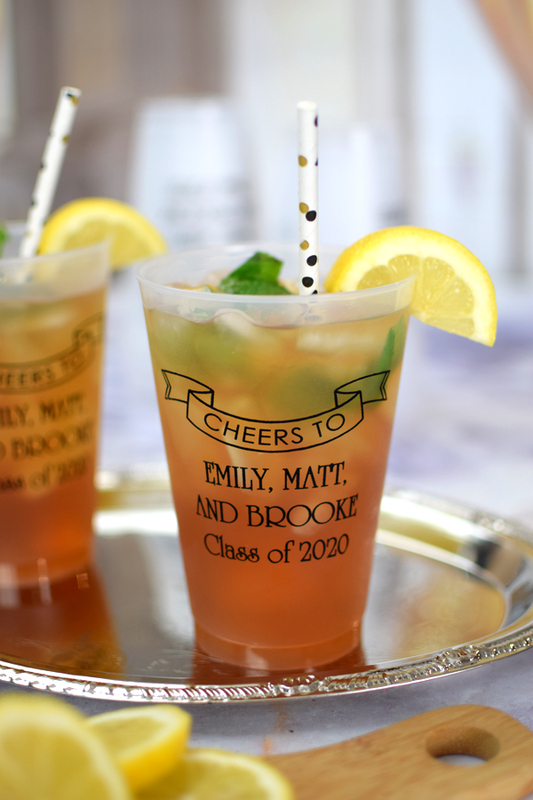 Personalized cups for a graduation party that arrived in the blink of an eye and designed exactly as I had hoped! Won't be putting these to use until June but I can't wait for the positive feedback! I was very pleased with my cups I ordered for graduation. The representative I talked to was very pleasant and helpful. They arrived very quickly. I highly recommend this company. Their products are great. Love the cup design we sent through. Product is great and cannot wait to use them for gifts at graduation party. Thank you! I ordered cups for a friends reunion and they were perfect, looked really nice and we all got to take some home and enjoy. These will be perfect for my daughter's graduation celebration party! Loved the look of the frosted cup and the black lettering made them look very sharp. The staff was helpful in getting back to me with questions I had about the product and design. Receive order very quickly Very happy with the product. Representatives were so helpful and pleasant to deal with. Would highly recommend tippytoad! Excited to use for spring break with our two graduates.